Apparently Japanese scientists are flummoxed by the flowering of a cherry blossom, which was grown from seed, few years before it was expected to bloom. This very special cherry tree is truly spatial. The seed from which it has grown from had been to space and back. This is big news to the Japanese people because cherry blossom has a notable place in their hearts. Afterall Japan is known as the land of the cherry blossoms; the blooming of cherry blossoms are agogly awaited, watched and celebrated as a festival all over Japan. The festival is called Hanami, which literally means viewing flowers, but it is not just for any flower. It is predominantly meant for the cherry blossoms. The traditions started fairly early in the Japanese history. Upper classes and the aristocrats used to picnic under the cherry blossoms which might had been such a wonderful experience as it inspired them to write fulsome poems. The tradition caught on and everyone started participating and having fun. People would bring food and drinks and eat under these majestic trees. The very intricate tea ceremony is also performed under the trees. The Hanami festival is not a set date in Japan as a whole. The celebration is determined by location, location, location! The blooming is usually forecasted and may vary from year to year. The Hanami festival, although predominantly about the gorgeous cherry blossoms have encompassed and celebrated more of the modern Japanese life. A cosmic mystery is uniting monks and scientists in Japan after a cherry tree grown from a seed that orbited the Earth for eight months bloomed years earlier than expected — and with very surprising flowers. 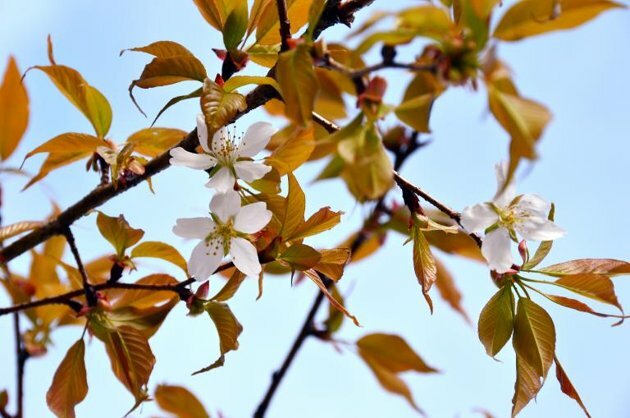 The four-year-old sapling — grown from a cherry stone that spent time aboard the International Space Station (ISS) — burst into blossom on April 1, possibly a full six years ahead of Mother Nature’s normal schedule. “We are amazed to see how fast it has grown,” Masahiro Kajita, chief priest at the Ganjoji temple in Gifu, told AFP by telephone. The wonder pip was among 265 harvested from the celebrated “Chujo-hime-seigan-zakura” tree, selected as part of a project to gather seeds from different kinds of cherry trees at 14 locations across Japan. By April this year, the “space cherry tree” had grown to around four metres (13 feet) tall, and suddenly produced nine flowers — each with just five petals, compared with about 30 on flowers of the parent tree. The seeds were sent to the ISS as part of “an educational and cultural project to let children gather the stones and learn how they grow into trees and live on after returning from space,” said Miho Tomioka, a spokeswoman for the project’s organiser, Japan Manned Space Systems (JAMSS). “We had expected the (Ganjoji) tree to blossom about 10 years after planting, when the children come of age,” she added.Kaori Tomita-Yokotani, a researcher at the University of Tsukuba who took part in the project, told AFP she was stumped by the extra-terrestrial mystery.